Lighten Up Lunch with Chicken and Avocado Salad - Home. Made. Interest. 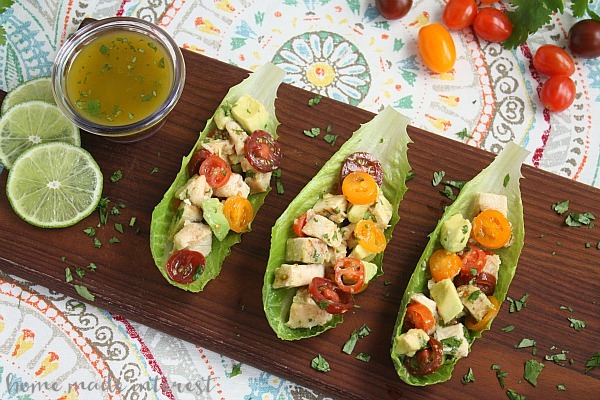 This light Chicken and Avocado Salad recipe is full of fresh ingredients for a simple lunch. Can you believe it is already February?! So, here’s the big question. How are you doing on all of those New Year’s resolutions? I’m pretty proud of myself. I’ve been working hard and trying to stick to a few changes, including getting back on track and eating right. Some days I think it is impossible. You know how it is, running all day, picking this kid up and dropping that one off, trying to do a few loads of laundry (how do we wear so many clothes?! ), before you know it the day is slipping away from you and you realize you haven’t eaten. I’ve been trying to really focus on making time to eat, and get my steps in, because honestly, I’m not very fun to be around when I’m hungry, LOL. This light chicken salad has been my savior. 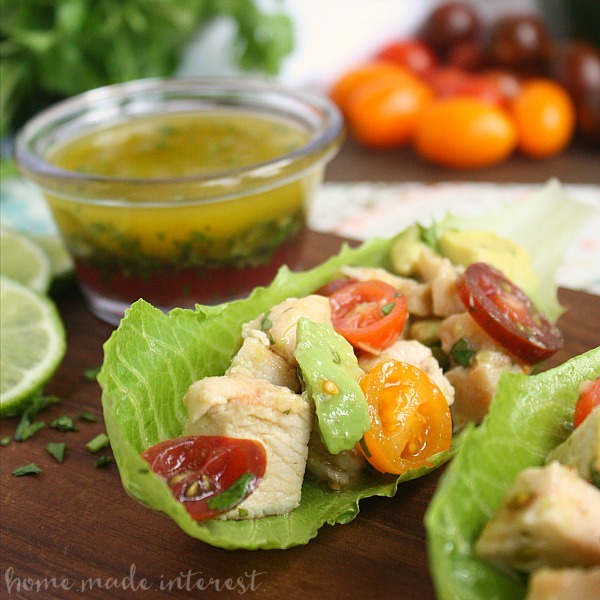 It is a quick and easy mix of grilled or baked chicken, usually whatever I have left over from dinner earlier in the week, fresh tomatoes, avocado, and a delicious lime cilantro vinaigrette. It only takes me 10 minutes to whip up and I either eat it straight out of the bowl or, if I want to mix it up a little I scoop it into lettuce wraps. Soooo good! For those days I’m out of the house all day I’ve started packing my lunch so I’m not tempted to stop and grab fast food. This recipe is perfect for that. Just wait to add the vinaigrette until right before you eat it so things don’t get all mushy. I tend to eat lunch pretty early so just about the time of day when I’m running around picking the kids up from different places I start to get hungry again. You know what I’m talking about right? It’s 4 o’clock, you’ve picking up the second kid from day care and you know you have at least 3 hours before you get everyone home and dinner on the table. I’m not gonna lie, things can get a little dicey when momma gets hangry. I’ve just started carrying SNICKERS® Crisper in my purse for these moments. 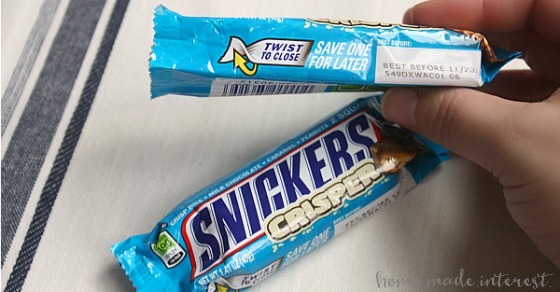 SNICKERS® Crisper is the first SNICKERS® bar with less than 200 calories per serving – a singles pack includes two squares at less than 100 calories each. Awesome right?! Look, after all of these years of up and down eating there is one thing I have learned, denying myself a little treat is a sure way to fall off the wagon. 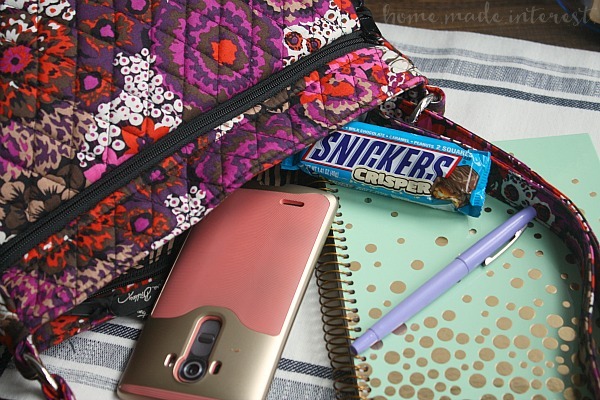 SNICKERS® Crisper means I get a little something sweet without going crazy. They are delicious too, they have multiple textures, in the form of crisped rice and peanuts, topped with a layer of caramel and coated in creamy SNICKERS® Brand milk chocolate, AND I’m totally digging their twist to close packaging. I can eat one and seal it back up to save for later. They are the perfect treat to keep me going without making me feel bad…the kids appreciate it too ;). Chicken and Avocado Salad is a low carb recipe packed full of fresh tomatoes, avocado, and chicken breast topped with a simple homemade vinaigrette. Whisk all ingredients together adding salt slowly until you reach the taste you like. Combine the chicken and tomatoes and pour 1/2 of the vinaigrette over them. Mix together until well coated. Add avocado and the rest of the vinaigrette and toss gently so you don't smash the avocado. Eat as is or serve them in lettuce wraps. Now you have it, my secrets to getting back on track and staying there in the first month of 2016. I hope you enjoy them and if you have any secrets of your own let me know!! 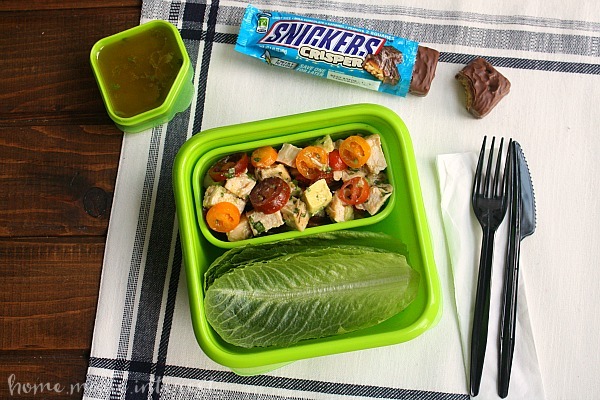 For a chance to win a FREE sample of SNICKERS® Crisper leave us a comment with your favorite lightened up lunch! For more information on SNICKERS® or the new Crisper variety, fans can visit SNICKERS® on Facebook or Twitter. That looks delicious! And I mean the salad and the Snickers! I’ve been eating salads lately with leftover chicken on top. Great way to use my leftover chicken and veggies in a healthier way! Snickers are my favorite!! Okay, no distractions. 🙂 Lighten-up lunch…I think my favorite is a grilled chicken breast sandwich with pepper jack cheese and avocado. No mayo needed, and you can go whole wheat bun if you want. Oh my gosh, yum! I’m so hungry and this just looks so good. Less calories and great taste! Score! Avocados!!!! My favorite. Sounds amazing. Wow! This looks super easy and delicious! Looks yummy, making for lunch this week! Yum! This looks a perfect go-to lunch!! Love these lettuce wraps!! We added pineapple chunks for a sweet burst of flavor. What a great idea! I will have to try that. That Chicken and Avocado Salad looks AMAZING! Its perfect for me right now with my diet restrictions too! but in 3 weeks I get to go back to eating ALL the things! And that includes my fav – SNICKERS! We eat a lot of taco-ish salad too 🙂 Super easy to make and delish! Love these! Great blend of flavored and easy to manage. I’ve been eating a lot of steamed brocccoli and cheese for lunch lately. This sounds so good! Yum! Chicken & Avocados sound amazing together! Mmm that looks delicious. I love making a light version of New England Clam Chower. Perfect meal for a chilly February day! What a creative way to eat the components! Love that no bread is needed. This looks absolutely amazing and can’t wait to try it! Thanks for the idea of the Snickers Crisper too!! Oh I looooove chicken salad! You hit the nail on the head! !